CAN I JUST SAY THAT THE LAST COUPLE OF WEEKS HAVE BEEN A CRAZY [EYE-OPENING] RIDE? THERE IS SO MUCH HAPPENING THIS SUMMER WITH THE NEW POP UPS I'M WORKING ON (MORE ANNOUNCEMENTS AT THE END! ), MY CLASS ROUTINES, AND ALL THE MARKETING INVOLVED TO SPREAD THE WORD. THE BEST PART IS THAT I'M LEARNING HOW TO CULTIVATE, HOW TO INVEST MY ENERGY INTO THE APPROPRIATE CHANNELS. I CAN'T TELL YOU JUST HOW IMPORTANT IT IS TO SPEND YOUR TIME AND EFFORT IN THE SPACES THAT WILL YIELD RESULTS, PLACES THAT WILL PRESENT CATALYSTS FOR PERSONAL DEVELOPMENT. IT'S ALL ABOUT GETTING OUTSIDE YOUR COMFORT ZONE. EVEN IF YOU FIND YOURSELF IN A TEMPORARY STEPPING STONE, THERE IS ALWAYS OPPORTUNITY EVEN IN THE WORST CIRCUMSTANCES. IN THE BEGINNING OF THE YEAR, ONE OF MY NEW YEAR'S RESOLUTIONS WAS VENTURING OUT INTO POP UPS AND PUTTING MY NAME OUT THERE. I HAD BEEN REACHING OUT FOR BUSINESS ADVICE AND TRYING TO GET MY WORK OFF THE GROUND. BUT WITH THE NEW WORK COMES PERSONAL CHANGE. NOW, OVER THE PAST FEW MONTHS, I'VE FELT A MIX OF EMOTIONS: FEAR, WORRY, DOUBT. IT'S SCARY. BUT IT'S PUSHING ME CLOSER TO MY END GOALS BECAUSE MORE DOORS HAVE OPENED AND MY SCHEDULE HAS FILLED UP! IT'S A MOMENTUM. AND I TRULY LOVE THAT I CAN HELP OTHERS DEEPEN THEIR PRACTICE. YOU KNOW SOMETIMES, LIFE REALLY SHOWS YOU WHAT YOU'RE MADE OF. IT'S BEEN A LOT OF LATE NIGHTS WORKING INTO THE EARLY HOURS, TRYING TO PREPARE FOR EACH DAY. IT'S BEEN A LOT OF EARLY MORNINGS AS MY DRIVE INTO WORK IS QUITE LONG. THROUGH ALL OF THESE ROUGH PATCHES ALONG THE WAY, I'VE MADE A POINT TO TAKE BREAKS WHEN I NEED THEM BUT ALSO CHALLENGE MYSELF WHEN OPPORTUNITIES SHOW UP. BUT NEVERTHELESS, I'M HERE. I'VE MADE IT. NO EXCUSES! SO LET'S GET THE WEEKEND STARTED RIGHT! LIFEONAMAT IS BACK THIS WEEK WITH PART II OF MY SPINE STRENGTHENING SERIES! IF YOU READ PART I, THEN YOU KNOW ABOUT THE BENEFITS OF TAKING CARE OF AND ALIGNING YOUR SPINE. PART II WILL BE A CONTINUATION OF WHAT WE LEARNED LAST MONTH. IF YOU WANT A CHALLENGE, THEN TRY MY FLOW BELOW! 1. BEGIN IN A STANDING LUNGE, THEN SET THE RIGHT KNEE TO THE GROUND. SHIFT THE HIPS FORWARD, KEEPING THE HIPS SQUARE. NOW SHIFT THE HIPS BACK TOWARDS YOUR RIGHT FOOT. SET YOUR HANDS TO THE MAT FOR BALANCE. FOR THIS POSE, BEGIN IN A DOWNWARD FACINGDOG. BRING THE RIGHT LEG UP TO A 45° ANGLE. START IN A TABLE TOP POSITION. THE RIGHT HAND GRABS THE RIGHT FOOT. REMEMBER TO GROUND THE LEFT HAND AND KNEE INTO THE MAT. KICK THE RIGHT LEG BACK, UP, AND OUT. BEGIN IN A PLANK POSE. FOR A CHALLENGE, LIFT THE RIGHT LEG. CHATURANGA, OR LOWER YOUR BODY DOWN TO THE MAT BUT DON'T LAY ON THE MAT. BREATHE IN, LIFT THE CHEST, AND FLOW INTO YOUR UPDOG. EXHALE, LIFTING THE HIPS HIGH INTO YOUR DOWNWARD FACINGDOG. PRESS THE HEELS INTO THE MAT, KEEPING THE SPINE STRAIGHT. FOR DANCER'S POSE, READ MY HOW TO HERE. WHEN YOU'RE UP AGAINST THE PRESSURES TO "FIT IN" AND FOLLOW THE STATUS QUO, REMIND YOURSELF TO TAKE A STEP BACK. RE-EVALUATE AND REMEMBER YOUR VALUES. NO ONE HAS THE POWER TO PULL YOU DOWN. NO ONE CAN ALTER YOUR PURPOSE. DALLASITES! 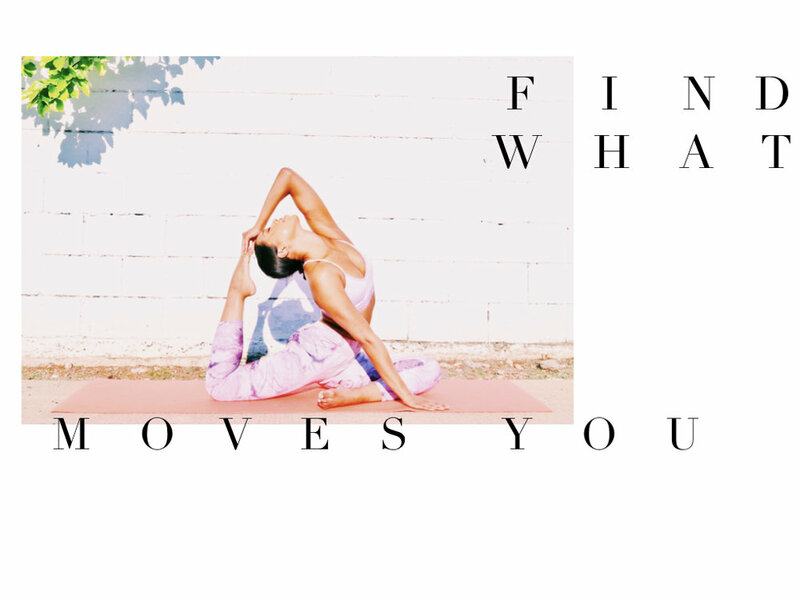 JOIN ME, NEXT MONTH AT NIKE NORTHPARK FOR A 9 AM YOGA FLOW! BRING YOUR MAT AND TOWEL! A PRIVATE SHOPPING EVENT WILL FOLLOW AND THE FIRST 20 REGISTRANTS WILL RECEIVE 20% OFF THEIR IN-STORE PURCHASE. YOU CAN SIGN UP HERE! I'LL BE OPENING THE SPACE TO 10 MORE STUDENTS SO STAY TUNED TO FIND OUT WHEN IT OPENS ON MY IG @SWIRLYBAE. I'M NOW TEACHING THIS SUMMER ON SATURDAYS FOR SIPS X SUN SALUTATIONS WITH MY FELLOW YOGI @MRJAYLAVIE AT IQON HAUS IN THE DALLAS DESIGN DISTRICT! SIGN UP THROUGH OUR FACEBOOK EVENT PAGE! ENJOY A YUMMY SIP AFTER CLASS TO GET YOUR DAY STARTED RIGHT! THANK YOU TO EVERYONE WHO HAS SUPPORTED ME!